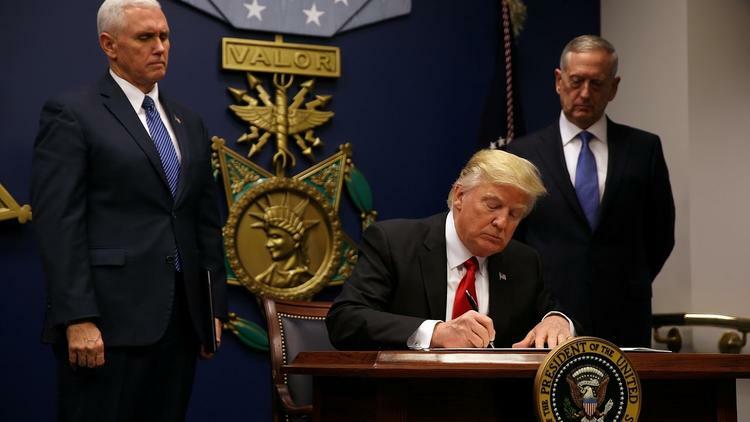 Trump’s shameful halt to the admission of refugees for 6 months and his 3-month pause in allowing entry to the US from seven countries is being advertised as driven by security concerns. The countries targeted are Syria, Iraq, Iran, Somalia, Libya, Sudan, and Yemen. What is remarkable to me is how much this list resembles the one drawn up by the Bush administration, only in that case Bush intended to overthrow their governments and risk plunging them into instability. Six of the countries are the same, with Bush having planned an overthrow of the Lebanese government, whereas Trump substituted Yemen. It was former NATO commander Gen. Wesley Clark who revealed that Bush had these plans to subject other states to the same tender mercies that left Iraq a basket case. The similarity in the hit list suggests a fatal inertia across administrations in policy-making. The world situation has changed since 2002. So Iraq is an ally and the US had been admitting nearly 16,000 Iraqi refugees a year with no incident. Obama showed that Iran could be dealt with through negotiations. Trump wants to ally with Putin in Syria, which is a de facto alliance with Syria. Libya is a mess but Gaddafi is gone. The rationale for targeting these countries, militarily or visa wise would be hard to defend now. Although Bush got bogged down in Iraq and could not pursue these other overthrows, over time the US military has targeted several in turn. The US overthrew the Iraqi government and plunged it into chaos. The US is probably acting against Iran covertly. It has subjected Somalia and Yemen to drone strikes. Bush’s plans for regime-change, egged on by the Neoconservatives, faltered during his own presidency. But then in 2011 when the Arab Spring broke out, the Obama administration called for the presidents of Yemen and Syria to step down. Both are still in power, though Yemen’s Ali Abdullah Saleh did step down in 2012; he came back in a coup backed by the Zaydi Shiite Houthi movement. The US has been helping the Saudi government to choose targets for bombing in Sanaa, and has given strategic and logistical help to Saudi Arabia for this war effort. In Syria, President Obama called on Bashar al-Assad to step down, and the US Central Intelligence Agency ultimately used the Saudis as a pass-through agency to send money and arms to some of the revolutionary militias that grew up (some of which went rogue or sold their weapons to Daesh [ISIS, ISIL]. I don’t personally think Obama’s actions in Libya resembled those planned by the Bush administration. The former was faced with a genuine national uprising and there is a question about whether the carnage would have been even worse if Moammar Gaddafi had been allowed to try to stay in power. So it seems that the actual situation is the opposite from the one advertised by Trump. These are not countries that pose a danger to the US. They are countries to which the US poses the risk, of instability and millions of displaced, when the US comes knocking.